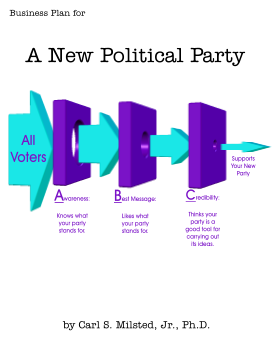 Back in my Libertarian Party days I heard a common lament from activists: “We struggle because we don’t promise to give out free money like the major parties…” Well, now that I have left the LP and been corrupted by pragmatism and concern for the poor, this gives me an idea: How about Free Money Party! Imagine the outreach mailings: business sized envelopes with lurid promises of free money – that happen to be true! The government already gives out trillions of dollars. Why not just give it away for free instead of making people fill out forms or grovel to social workers? “Freedom and Free Money!” would make a nice slogan. Yes, I am describing a single-issue party, a party to carry the citizen dividend idea to the masses. See my welfare series for why this is a good idea, or read Charles Murray’s In Our Hands. Yes, we are talking about a truly diverse coalition, a motley crew on par with the Democrats of yore! But with only one core issue – replacing our complex system of welfare programs and tax expenditures with a citizen dividend – we could still keep platform debates manageable. In a sense I have already tested the marketing the idea to the masses. I have another site, freemoneyforall.org, that pitches this idea, minus the political party to make it happen. My evil plan was to promote the citizen dividend concept while making money with the get rich quick ads that could be served on a free money themed site. ‘Twas quite lucrative when I was near the top of the search pages, but a bit too evil: most of the people coming to the site were desperately poor, and mostly stupid. I removed the ads, and have let the site rust. But as a political party portal, the site could be revived and simplified. Reaching the dumb and desperate is difficult for a low budget political party. On search traffic alone the site was getting over a thousand unique hits per day. Hide the wonk-friendly details and economics behind pages with simple diagrams and videos, and the party markets itself. Yes, this is a cynical and sleazy approach to building a political party, but it is also a good cause. Reducing poverty by 90% is more moral than slavishly selling the Zero Aggression Principle. And a Free Money Party would likely increase liberty more than the Libertarian Party will (unless Johnson/Weld actually win in 2016). When the poor have a marginal incentive to work, the argument for the evil Drug War weakens substantially. Free Money begins with an F, which should provide no confusion with any other third party or independent campaign. I’m having way too much fun with this one.